TOKYO (Reuters) - Sony Corp slashed its earnings guidance for the third time in a year on Thursday to barely 10 percent of its initial outlook as further losses from its PC exit cast a pall over its struggling electronics division. The repeated misses - the latest just two weeks before Sony announces full-year results - are fuelling anger among investors even as Hirai rebuffs billionaire hedge fund manager Daniel Loeb's proposal to spin off Sony's profitable entertainment business. "To be honest, I really wonder if he's got a grip on what's going on with all his businesses," said Yasuo Sakuma, a portfolio manager at Bayview Asset Management in Tokyo, who does not own Sony shares. "Cutting forecasts at this time; are they trying to hide something or have they lost it?" 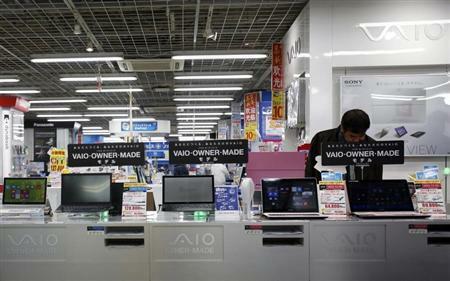 It said it would have to write down a further 30 billion yen on its Vaio PC unit, reflecting a sharp drop in sales as consumers shunned the brand following Sony's decision in February to get out of the business. That would also swell Sony's restructuring costs this year, which it said in February would reach 70 billion yen. Before Thursday's cut, Sony had missed its forecasts in 10 of the prior 12 years, excluding gains from asset sales, the worst among 30 Japanese consumer electronics makers, analysts at brokerage firm Jefferies calculated in March. Since Hirai was named chief executive in February 2012, Sony's stock has risen 30 percent, far less than the wider Japanese market's 65 percent climb for the period. He has started selling key assets in a bid to restore profitability at the company's struggling electronics division, where 10 years of losses on TVs have totaled $7.8 billion. But the focus is still on profitability within electronics, on which Hirai has pegged Sony's rebirth using a three-prong strategy around mobile, imaging and gaming. Sony's entertainment business, another reliable contributor of profit, came under pressure last year from Loeb's proposal for a spinoff to create more value for shareholders. Loeb's fund, Third Point, had no immediate comment on Thursday's earnings revision.